Who will win the fight between Falcon and Hawk? Falcon and hawk are generally considered as similar prey birds by many people but they differ from each other in many ways. There are many factors that put them in different ways. Falcons belong to the same family Falco whereas not all hawk belong to the same family and belong to different genera. Falcons are known to attack their prey with their beaks whereas hawks use their feet to kill their prey. If you want to distinguish between the two then first you must understand the basic features of the two birds. 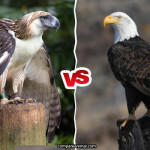 After reading this article you will be in a position to easily differentiate between the two prey birds. Here is a comparison of these two. Falcons belong to the family of the genus Falco. Falcons are known for their speeds when they are fully mature. They use their beak to attack their prey. Falcons are highly populated bird and can be found all over the world except Antarctica. Falcons can adapt in any circumstances and hence we can find them living in almost all kind of habitats. Whether it is desert, arctic or grasslands they can be easily found in all type of surroundings. There are around 40 species of falcons living all over the world. The normal lifespan of falcons varies from 12-20 years whereas in some cases falcons can also live for up to 25 years. The largest species of the falcon is Gryfalcon whose length is around 20-25 inches (50-63 cm) and weighs around 2 to 4-1/2 pounds (0.9-2 kg). Falcons are carnivorous in nature and their diet depends upon the rodents, fish and small insects. They have long wings and a medium sized tail and they are mostly dark brown in colour whereas few species are grey as well. They are known to hunt during daytime and hence are known as diurnal birds. 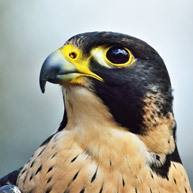 Falcons are wide-known for their eyesight and can see up to 8 times clearer than a normal human eye. Falcons are very fast flying birds. The peregrine falcon can fly with a normal speed of 200 mph (320 km/h) while diving. In certain cases, it has been found that falcons can also reach a speed of up to 242 mph (389 km/h). Female falcons are usually larger than male and both the mates are known to take care of their offspring. Contrary to the Falcons, the Hawks belong to a number of genes. The Accipiter hawks are most commonly found on earth hence it is the largest genus of hawks. Hawks are more clever prey birds than falcons and they do a sudden attack on their prey. They are known for their long tails. Similar to falcons they are also widely populated and can be found all over the world except Antarctica. Hawks can also adapt in any kind of habitats hence you will find them in all kind of environmental conditions. Whether it is arctic, desert, grasslands you can find them everywhere. Hawks have more than 270 species on the earth. Just like the Falcons their sizes also differ from species to species. They can be as long as 22 inches and can weigh up to 5 pounds. Similar to the Falcons, the females are usually larger than the males. They sharp bill is their weapon while killing their prey. They also use the same to tear apart their prey. 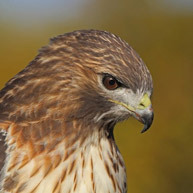 Hawks are also widely known for their great eyesight and can clearly locate their prey from a distance of up to 100 feet. Hawks have one special characteristic that they can distinguish between different colours which many other animals can’t. Similar to the Falcons they also hunt in the daytime and hence are known as a diurnal animal. Hawks are not specific about their diet and can eat anything that comes their way. They can eat rodents, frogs, snakes, other reptiles and other birds as well. Male hawk can perform aerobatics for up to 10 minutes and are widely known for their dance performance in the air. They mate with the same partner unless and until one of them dies hence fall under the category of monogamous animals. They normally have a lifespan that varies from 13-20 years whereas there are certain cases in which hawks had survived for 25 years. Falcons and hawks are quite similar by many factors but there are certain points that differentiate them. 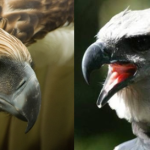 Hawks have a smoother beak when compared to falcons which are known to have angular bend beak which they use while killing their prey. Hawks are slower prey birds when compared to falcons which are known for their speed. Hawks have their average size as an advantage over the Falcons. When it comes to competition it is really hard to guess who will win it as both of them are impeccable prey birds. 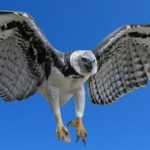 Hawks are known to hunt mammals as well and even they have attacked humans which give them an upper hand but falcons are fast and they can also tear apart anything that comes their way. 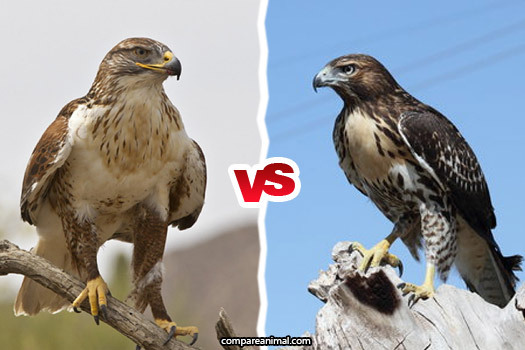 It is really hard to predict the winner but due to the more aggressive nature of hawk, it can be a winner but no one knows if a falcon can flip the game. This is a close one. It could go either way. I might give the edge to the falcon, because of speed, but who knows. 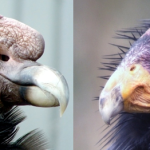 Both of these birds are capable of killing each other. I agree with you but think that a hawk has a slight advantage.